I know I’ve posted about things to do during the Holiday’s in Indy, but here are a few more that look like a lot of fun! 1. Christmas at the Lilly House – Indianapolis Museum of Art, 4000 Michigan Road, (317) 923-1331, imamuseum.org, Nov. 15 to Jan. 4. The historic Lilly House — on the IMA grounds — will twinkle with holiday decorations inspired by the 1930s and 1940s. Amongst the trees, wreaths and greenery, visitors can see ornaments typical of Depression-era frugality and wartime shortages, as well as the exuberance of the post-war era. 2. Festival of Trees – Indiana History Center, 450 W. Ohio St., (317) 232-1882, indianahistory.org, Nov. 22 to Jan. 3. The Indiana History Center’s annual holiday festival features an exhibition of historical photographs with a holiday theme. 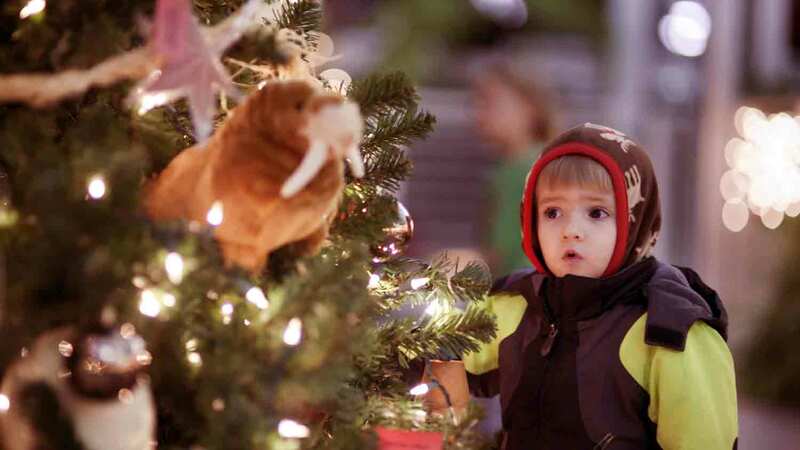 Visitors can also experience a winter wonderland of 25 holiday trees, decorated with themes such as “Home for the Holidays” and “Santa’s Workshop.” Other activities include holiday film screenings, kid-friendly crafts and adult painting classes. 3. 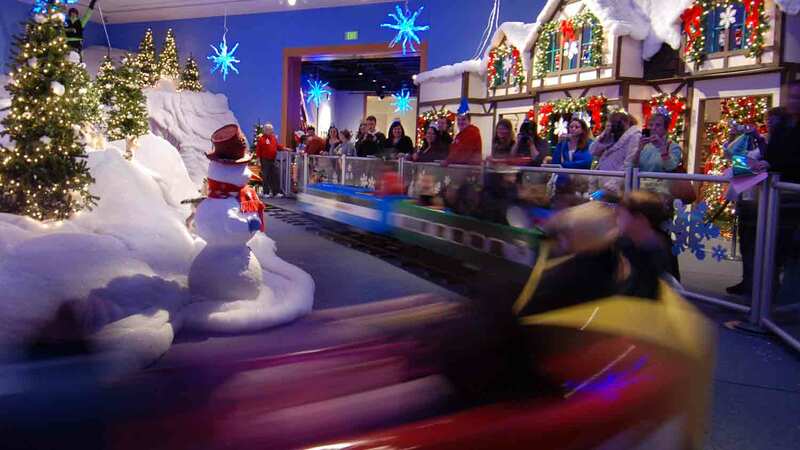 Jingle Rails: The Great Western Adventure – Eiteljorg Museum of American Indians and Western Art, 500 W. Washington St., (317) 636-9378, eiteljorg.org, Nov. 22-Jan. 19. 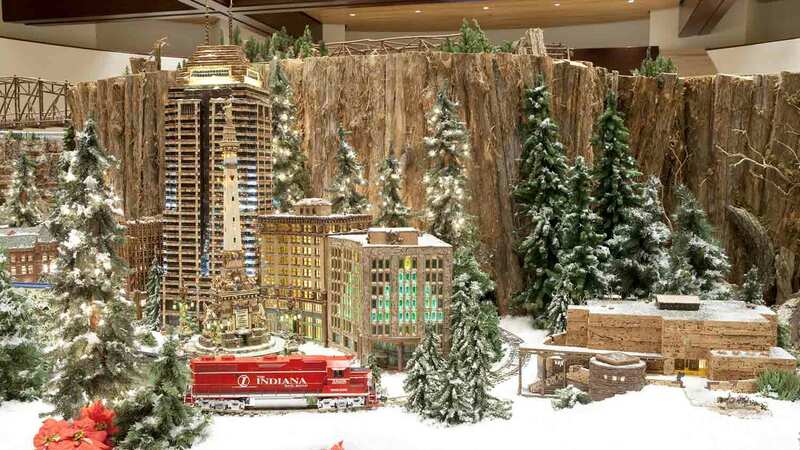 Now in its fifth year, Jingle Rails is a wonderland of model trains, which chug along nearly 1,200 feet of track. They go through tunnels, over bridges and trestles, and past scale models of national landmarks, such as Mount Rushmore and the Grand Canyon. The display also includes local landmarks like Lucas Oil Stadium and Union Station — all decorated for the holidays. Still searching for that perfect holiday gift? Don’t miss the museum’s Winter Market (10 a.m. to 5 p.m. Dec. 6), featuring handmade goods from more than 30 local artists. Choose from a variety of pop-up art classes, ranging from $20 to $60. Several focus on making glass ornaments, such as snowmen and glass balls. Others guide students through making holiday jewelry or crocheted wire snowflakes. Some classes are family-friendly, while others are perfect for a December date night. 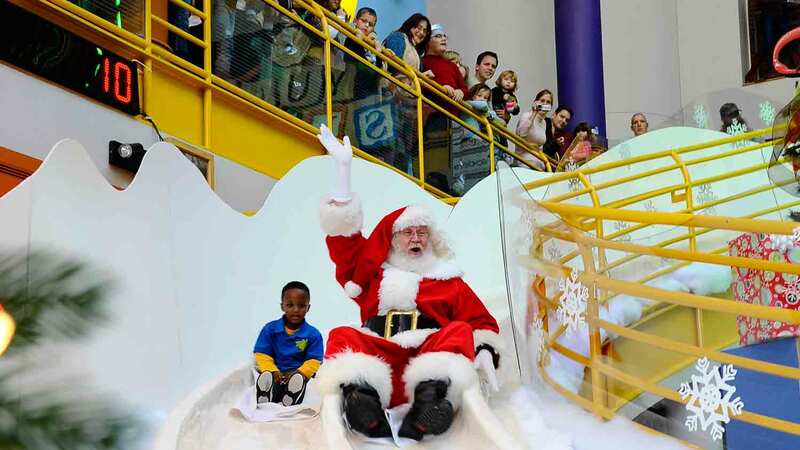 During Jolly Days, the Children’s Museum transforms its staircase into a two-story slide, surrounded by festive holiday décor. Children can “ice skate” in the sock-skating rink and try indoor versions of winter activities like ice fishing. Come Nov. 28 to see Santa arrive in style — not in a sled, but in a race car. The museum also offers several opportunities to breakfast with Santa. 6. Celebration Crossing – Indiana State Museum, 650 W. Washington St., (317) 232-1637,indianamuseum.org, Nov. 28-Dec. 31. Santa and Mrs. Claus will arrive by helicopter Nov. 28 to open the Indiana State Museum’s annual holiday extravaganza. While children make crafts and ride the Santa Claus Express train, parents can explore re-created L.S. Ayres holiday window displays. Other activities include breakfast with Santa, tea parties in the historic L.S. Ayres Tea Room, and live music from local bands and choirs. 7. Christmas at the Zoo – Indianapolis Zoo, 1200 W. Washington St., (317) 630-2001,indianapoliszoo.com, Nov. 28 to Jan. 4. 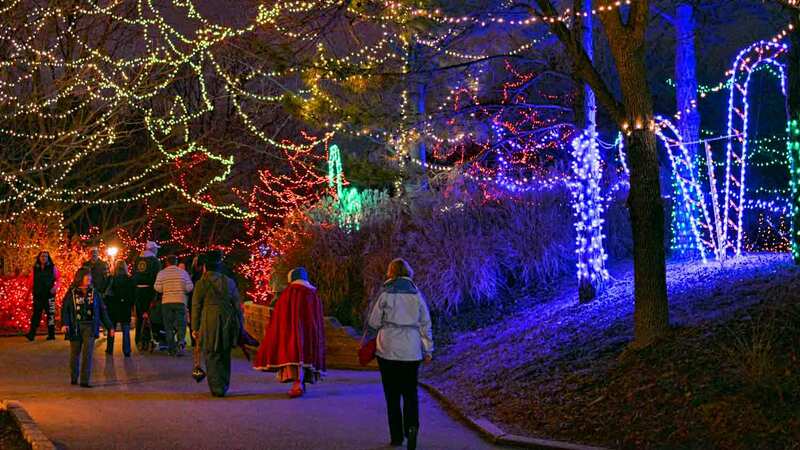 Back in 1967, the Indianapolis Zoo was the first zoo in the country to hold a holiday lights event, and it’s still going strong in its 47th year. Check out the vibrant holiday displays as you visit the animals — especially ones such seals, polar bears and red pandas that enjoy the cold weather. Visit Santa’s workshop in White River Gardens, enjoy carols performed by local school choirs, sample holiday refreshments, and go on a scavenger hunt for hidden mistletoe throughout the grounds. 8. Holiday Adventures at Conner Prairie – Conner Prairie, 13400 Allisonville Road, Fishers; (317) 776-6006;connerprairie.org, Nov. 28-Jan. 4. Conner Prairie bustles with activity during the holiday season. Families can sign Holiday Adventures — a series of festive daytime activities and crafts in 1836 Prairietown. At night, return for Conner Prairie by Candlelight. The family-friendly Prairietown tour features costumed interpreters, who discuss the history of various holiday traditions. Amid the holiday hustle and bustle, it’s a peaceful, low-tech way to reconnect with the holiday spirit. Afterward, check out Gingerbread Village, featuring dozens of amateur and professional gingerbread creations. 9. 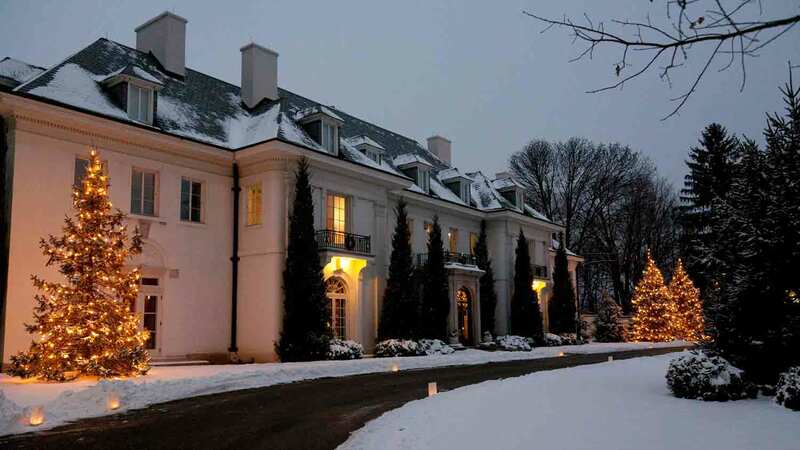 Holiday Hullabaloo – Indianapolis Museum of Art, 4000 Michigan Road, (317) 923-1331,imamuseum.org, 5 to 9 p.m. Dec. 4. The IMA will offer discounted shopping, as well as live music, free gift-wrapping and refreshments. Watch pottery demonstrations by artist Mary Firestone and preview the new collection from Patricia Locke Handmade Jewelry. Stop by the Jane H. Fortune Gallery to see Paul Gauguin’s “Christmas Night (The Blessing of the Oxen),” one of several artworks with a holiday theme. 10. 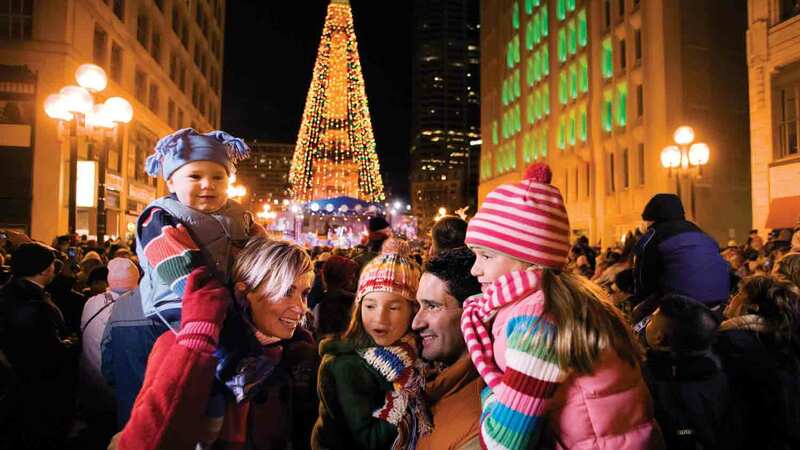 Indianapolis Symphony Orchestra: “Yuletide Celebration” – Hilbert Circle Theatre, 32 E. Washington St., (317) 639-4300, indianapolissymphony.org, Dec. 5-23. 11. INDIEana Handicraft Exchange’s Holiday Mini – Harrison Center for the Arts, 1505 N. Delaware St.,indieanahandicraftexchange.com, 5-10 p.m. Dec. 5. Your favorite summer craft fair is back for the holidays, featuring more than 45 vendors of handmade, artisan goods. Check out gift items from Boris Loved Natasha, 1337motif, Get Lathered Soap Company, Growler Girls and several jewelry artisans. You can also pick up gourmet goodies from vendors such as 240sweet, Chocolate for the Spirit, Newfangled Confections and Sage’s Simple Syrups. More than 25 Stutz artists will offer holiday gift items such as paintings, metal sculptures and jewelry. Also, check out the walls of the Raymond James Stutz Art Gallery, which will be decked out with artwork from more than 90 Stutz artists. 13. Tiny III: A Really Big Group Show – Gallery 924, 924 N. Pennsylvania St., (317) 631-3301, indyarts.org/gallery-924, Dec. 5 to Jan. 2. Gallery 924’s third annual holiday show features hundreds of tiny artworks from dozens of Central Indiana artists. It’s an affordable way to start an art collection — or find a unique holiday gift. The show opens Dec. 5 in conjunction with the IDADA First Friday Art Tour. 14. Indiana Wind Symphony: “Holiday Dreams” – The Palladium at the Center for the Performing Arts, 1 Center Green, Carmel; (317) 843-3800; TheCenterPresents.org, 7:30 p.m. Dec. 6. Join the Indiana Wind Symphony for its “Holiday Dreams” performance, featuring beloved tunes such as “It’s the Most Wonderful Time” and “White Christmas.” There’s a “Silent Night” sing-along, as well as classical selections from “The Nutcracker” and Handel’s “Messiah.” Tickets range from $5 to $40. Other Palladium holiday events include the Carmel Symphony Orchestra’s “Holidays!” performance (Dec. 13) and the Indianapolis Symphonic Choir’s “Festival of Carols” (Dec. 20-21). 15. Rocky Ripple Holiday Bazaar – Rocky Ripple Town Hall, 930 W. 54th St., rockyripple.org, 10 a.m. to 3 p.m. Dec. 6. Rocky Ripple’s 15th annual holiday festival benefits arts programs within the Rocky Ripple Parks Endowment Fund. The schedule includes live music, food vendors and a variety of local artist exhibitors, such as painters, sculptors, woodworkers and jewelry artisans. 16. Yelp’s Totally Bazaar – Indianapolis Central Public Library, 40 E. St. Clair St., (317) 275-4100, yelp.com/events/Indianapolis-yelps-totally-bazaar-4, 6 to 10 p.m. Dec. 11. This hip pop-up shopping party features more than 120 local vendors, including food artisans, jewelers, visual artists and vintage shops. Enjoy the live music or grab a snack from a nearby food truck, such as Spice Box or Scratchtruck. Beer and wine vendors include New Day Craft, Fountain Square Brewing Co., Sun King Brewing Co. and more. 17.Jordan College of the Arts: “Rejoice!” – Clowes Hall, 4602 Sunset Ave., (317) 940-6444, cloweshall.org, 7:30 p.m. Dec. 12-13. This annual concert features your favorite holiday music performed by student ensembles from Butler’s Jordan College of the Arts. If you’re seeing the university’s annual “Nutcracker” ballet performance at Clowes Hall, Dec. 4-7, this is a perfect follow-up to keep the holiday spirit alive. 18. “White Christmas” – The Palladium at the Center for the Performing Arts, 1 Center Green, Carmel; (317) 843-3800; TheCenterPresents.org, 2 and 7:30 p.m. Dec. 12. As part of the Great American Songbook Film Series, the Palladium at the Center for the Performing Arts will screen “White Christmas.” The 1954 classic stars Bing Crosby, Danny Kaye and Rosemary Clooney. Admission is $10. 19. Indianapolis Chamber Orchestra: “Messiah” Sing-Along – Indiana Landmarks Center, 1201 Central Ave., (317) 940-9607, icomusic.org, 7:30 p.m. Dec. 13. Several ensembles are performing Handel’s “Messiah” this holiday season, but only the Indianapolis Chamber Orchestra offers a sing-along version. Conducted by maestro Kirk Trevor in his farewell season, the performance features four renowned vocal soloists — plus plenty of opportunities for audience participation. For a more traditional version of Handel’s “Messiah,” pick up tickets to the ICO’s performance on Dec. 14, in conjunction with the Tabernacle Presbyterian Church Sanctuary Choir. 20. Indianapolis Symphony Orchestra: “Classical Christmas” – Howard L. Schrott Center for the Arts of Butler University, 610 W. 46th St., (317) 639-4300, indianapolissymphony.org, 5:30 p.m. Dec. 13. The ISO is known for its extravagant “Yuletide Celebration” (Dec. 5-23). But if you’re looking for a more intimate experience, check out “Classical Christmas.” The performance will be conducted by Raymond Leppard at the cozy Howard L. Schrott Center for the Arts. Tickets are $45. 21.Indianapolis Children’s Choir: “Angels Sing” – St. Luke’s United Methodist Church, 100 W. 86th St., (317) 940-9640,icchoir.org, 7 p.m. Dec. 19 to 20. You’ve probably seen a televised version of the Indianapolis Children’s Choir’s annual “Angels Sing” performance. This year, why not see the real thing? The concert features the ICC’s elite choirs, such as the Indianapolis Youth Chorale and Bel Canto. If you want to see the younger singers, check out the “Celebrate the Season” performance, 12:30 p.m. Dec. 20, also at St. Luke’s. 22. Straight No Chaser: “Happy Hour Tour 2014” – Old National Centre, 502 N. New Jersey St., (317) 231-0000, sncmusic.com, Dec. 21-22. Indiana’s favorite a cappella ensemble, Straight No Chaser, returns to Indianapolis for four performances at Old National Centre — just in time for Christmas. Keep your fingers crossed for hilarious hits like “The 12 Days of Christmas” and “The Christmas Can-Can,” as well as more traditional holiday favorites. 1. Wear clothes that fit, but breathe and move…maxi dresses can be a great option, but please, buy a size that fits which means ladies, that it should completely cover your breast and be loose enough that it is not vacuum sucked to your body. 2. Men, PULL UP YOUR PANTS! I have no desire to see your underwear or worse! Hasn’t anyone every told you that women would prefer to see a fitted pair of jeans on a male backside? My favorite are the guys who literally have to hold their pants up with one hand while they are walking because they are so far down…what if they needed to run? Look up the origin of this style…bet you pull them up after that! 3. Leave the rubber flip-flops at home, these aren’t really shoes. Let’s face it, you are at a state fair, looking at the world’s biggest pig, he’s not going to be impressed with your shoes! I am the shoe queen, if i’m going to be out walking around, I wear good, solid shoes, but if I’m standing around a booth, usually wearing something cute with a heel! 4. If you are wearing a long top, make sure your shorts are longer than your top…I have seen several that looked like there was nothing underneath…maybe their wasn’t, but I don’t want to know. 5. Pay attention to what your T-shirt slogan says…this is a family event and some of you are nasty! 6. Ladies, tiny T-shirts and short short short shorts are not appropriate, I don’t like seeing cheeks hanging out and I’m sure the parents there with their small children don’t like having to explain why you have no respect for yourself. 2. Don’t believe all you hear, spend all you have or sleep all you’d like. 3. Don’t say “I love you” unless you really mean it. 4. When you say “I’m sorry,” look the person in the eye. 6. Love deeply and passionately. You might get hurt, but it’s the only way to live life completely. 8. Don’t judge people by their relatives. 11. Say “bless you” when you hear someone sneeze. 12. Don’t let a little squabble damage a good friendship. 13. When you realize you’ve made a mistake, take immediate steps to correct it. 18. In disagreements with loved ones, deal with the current situation. Don’t bring up the past. I think these are great tips and try to live my life accordingly…how about you?